A facelift will also produce a lift and an improvement in the contour of the neck. Additional procedures can also be performed on the neck to enhance the lifting produced by a facelift (e.g. a posterior cervicoplasty) at the time of the facelift procedure. It is also possible for an isolated lift to be performed on the neck without a facelift. Dr Belt is happy to advise which of these procedures would be appropriate for you to achieve your desired results. In specific cases, an alternative treatment is to perform direct excision of skin from the front part (anterior) of the neck. This is then pulled together and two Z plasties are inserted into the scar. This has the advantage of addressing excess skin at a direct level. The obvious drawback of this procedure is that is does leave a scar in the midline of the neck. It is a very good technique for patients who are older and who have thinner skin which is more prone to relapse. Furthermore, this subgroup of patients also generally produce better scars and these scars are less obvious. 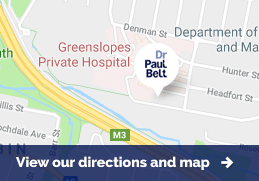 Dr Belt is happy to see you, make an assessment and advise which procedure is appropriate and ideal for you at the time of your consultation.